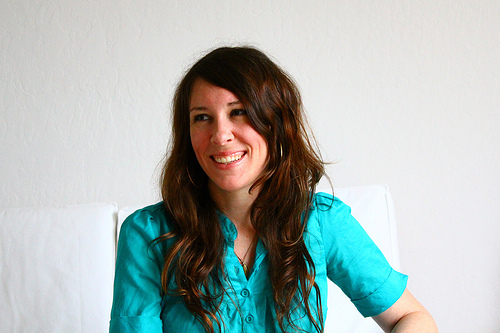 I met Dafna about two years ago at the first Eat Retreat. She is the awesome force behind INNA Jam, which has received tons of accolades in the last couple of years, and with good reason. It’s ridiculously good stuff, and she’s dedicated to sourcing some of the finest fruits from some of California’s finest small growers. When you invite Dafna to a party, she woos folks with a surplus of jams (spicy jalapeño jam + halloumi cheese = a revelation), or some obscure vegetable like ground cherries (I was first introduced to these fine fruits by Dafna.) These things endear her to me. Plus, she’s an incredible business lady whose work ethic and dedication to her company is inspiring. So when she asked me to collaborate with her on devising some creative ways to incorporate jam into cooking and then photographing the results, I was pretty darn stoked. It was, and is, an ideal collaboration. 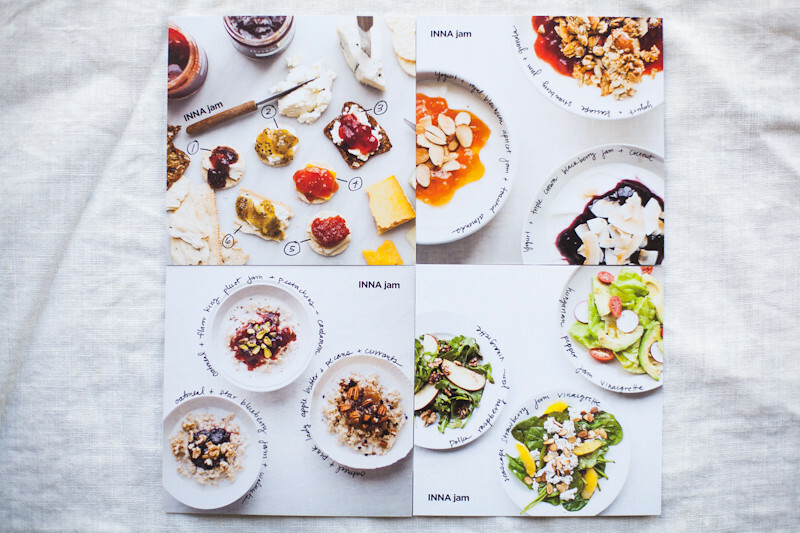 The result is a series of cards with creative jam pairing ideas that are shipped with jam orders and available at the INNA jam HQ. I’m so proud of the work that we made; a giveaway was an easy next step. 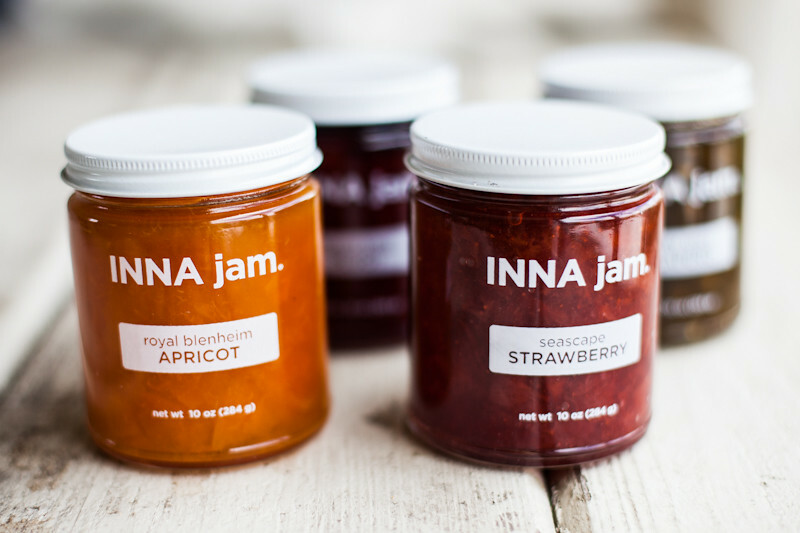 One lucky person will receive a box of 4 of her most popular jams (Jalapeño, Apricot, Pluot and Strawberry! ), along with the recipe cards that we produced. To enter, leave a comment sharing your favorite creative way to use jam. The contest ends next Wednesday, July 24th at 9 PM PST. The winner will be announced next Thursday. PS: The talented, kind and helpful Andrew Scrivani is teaching an awesome food photography course over the weekend via Creative Live. I had the good luck to attend one of his workshops last year. I highly recommend it if you’re interested in learning more about food photography! PPS: My manuscript due in 2 weeks! Home stretch. Powering. Wish me luck. Pamela @ Brooklyn Farm Girl - Good luck in the next 2 weeks, you can do it!! Molly - Those jams looks scrumptious! I love using orange marmalade in my glaze for roasted chicken. This jalapeño jam could be wonderful done that way too. Sasha - Such a great idea for a project! I will forever be loyal to pairing jam with cheese on some good sourdough bread, thinly sliced, or on crostini. A favourite combination is pear and ginger jam with very sharp cheddar. Also, cherry and bleu is always a winner. Aujourd'hui, j'ai testé - Hello! Thank you again, see you! julie - Summer salad dressing flavors can be had year round with a great jam. Add jam of choice, balsamic vinegar, dash of olive oil, lemon, salt, pepper, a little minced onion and fresh chives. Whisk, pour and enjoy! Emily Shields - I love delicious jams with a great wedge of brie cheese and water crackers (the crackers are only a vessel for supporting the cheese and jam, best for them to be almost flavorless. I know it’s not necessarily cooking but it’s one of my favorite go-to’s for appetizers or celebratory eats. Also, my boyfriend loves jam and he has a tendency to it straight out of the jar which is what he did when I received a jar of the INNA Apricot Jam as a gift from Good Eggs. We are big big fans. Heather P. - I have toddlers so our creativity consists of pb and j:) I do love a good soft cheese on a cracker topped with a sweet jam. 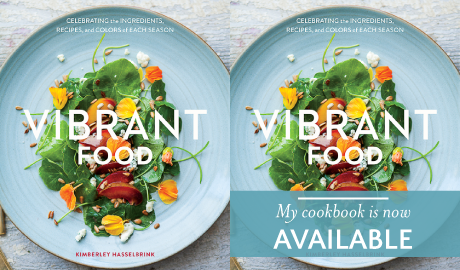 Christine - Good luck in this final stretch on the cookbook! It’s going to be great! Meghan - I like jam on lamb. It’s delicious AND it rhymes. EL - I’m not sure that I am very creative with jam. It’s so special for me still. So I mostly am boring and eat it on toast. I do like to frost cakes with it. . .
Bee Williams - I use jam in a ton of stuff, but I always have a jar of apricot jam and orange marmalade on hand. Anytime I need to glaze a fruit dish or a simple baked good it’s so handy. I also like to add a bit of vinegar to warmed jam for a sweet/ sour glaze on fish, veg, or poultry. Shelley - My favorite jam is served atop a warm baked wheel of brie and a sprinkle of pistachios. professional christmas lights - You’re so cool! I don’t think I’ve truly read through something like this before. So wonderful to discover somebody with a few original thoughts on this subject.